On Saturday afternoon, September 29th, 2007, the cable television channel Nickelodeon showed nothing for three hours to celebrate “Worldwide Day of Play”, encouraging children to get off the couch and be active. The “Worldwide Day of Play” is part of Nickelodeon’s “Let’s Just Play” campaign, in partner with the Alliance for a Healthier Generation, to encourage kids to participate in active, healthy and playful lifestyles. The goal of the Alliance for a Healthier Generation is to create a new generation of healthy Americans by addressing one of the nation’s leading public health threats — childhood obesity. So it should be simple, right? Don’t let kids spend so much time in front of the television … get them to be more active and they won’t be overweight. Or is there more to it? Let’s explore some of the science. The results of a study on television viewing and body weight in children earlier this year concluded that kids who watched the most TV or ate the fewest meals with their families were at risk of being or becoming overweight . The analysis addressed the eating and activity factors associated with the onset of becoming overweight and persistent overweight in 8,000 children from kindergarten to third grade. Researchers identified three groups of children: never overweight, overweight onset and persistent overweight. Children who were never overweight watched approximately 14 hours of television per week (approximately 2 hours per day). Children who were persistently overweight were watching almost 16 hours of television per week. Did you catch that? Children who watched just 2 more hours per week — 17 minutes of “extra TV” per day — were constantly overweight. That’s a rather surprising result, isn’t it! Nevertheless, the results are consistent with a number of other investigations, including a pivotal study done in 1998 by researchers at Johns Hopkins University School of Medicine along with experts at the Centers for Disease Control and Prevention and the National Institutes of Health. The study assessed the participation in vigorous activity and television watching habits and their relationship to body weight and overweight in U.S. children, concluding that a child’s weight increases with the number of hours they spend watching television each day . These experts called it an “epidemic” of childhood obesity. However, in the years since, studies have shown that while reducing TV viewing time of preschool- and school-aged children may reduce their risk of being of becoming overweight, most report small significant associations . Perhaps the problem isn’t so much children watching too much TV, but what they’re watching on it. A diary-survey study was conducted recently, studying the associations between children’s television advertising exposure and their food consumption patterns . The study in 234 households with children aged 4-12 years investigated the associations between children’s exposure to food advertising and their consumption of advertised food brands, advertised energy-dense food product categories and food products overall. The results showed that children’s exposure to food advertising was significantly related to their consumption of advertised brands and energy-dense product categories. The relation between advertising exposure and overall food consumption only held in low-income families. … influencing their cognitions as expressed though attitudes toward fruit and vegetable consumption and preferences for these foods products. Indeed, a study on the nutritional content of television food advertisements seen by children and adolescents in the U.S. found that the overwhelming majority of commercials related to food products are of poor nutritional content . The results of the study showed that 98% of the food product advertisements viewed by children aged 2 to 11 were high in fat, sugar or sodium. The results weren’t much better for adolescents aged 12 to 17, with 89% of the advertisements of poor nutritional content. 50% of all ad time on children’s shows is for food. 34% of the food products in ads targeting children and teens are for candy and snacks; 28% are for cereal; and 10% are for fast food; 4% are for dairy products; 1% are for fruit juices. Of the 8,854 ads analyzed, none were for fruits or vegetables. Among all food ads targeting children and teens, the most common primary appeal is taste (34%), fun (18%), the inclusion of premiums or contests (16%) and the fact that the product is unique or new (10%). Only 2% use claims about health or nutrition as a primary or secondary appeal in the ad. Make sure your kids get plenty of exercise and limit their television viewing time. Obviously, spending too much time in front of TV takes away from other activities, whether it be physical, social or personal. Recognize that many of the food associations kids have are related to television advertising. Changing a child’s eating attitudes and behavior can be and probably will be difficult. In some cases, trying to control your child’s diet can be counterproductive. A few years ago, a study of snack intake, eating motivations and body dissatisfaction revealed that children whose parents indicated greater attempts to control their child’s diets reported higher intakes of both healthy and unhealthy snack foods . The authors suggested that a positive parental role model may be a better method for improving a child’s diet than trying to change the foods they eat. It’s not necessarily bad for your kids to watch TV. It’s monitoring what they watch that may be more important than how much they watch. What do you think? 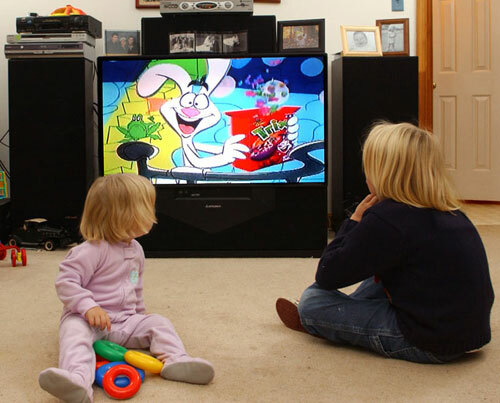 Do you monitor your children’s TV viewing? How much exposure do they get to food advertisements? Andersen et al. Relationship of physical activity and television watching with body weight and level of fatness among children: results from the Third National Health and Nutrition Examination Survey. JAMA. 1998 Mar 25;279(12):938-42. Sherry B. Food behaviors and other strategies to prevent and treat pediatric overweight. Int J Obes (Lond). 2005 Sep;29 Suppl 2:S116-26. Powell et al. Nutritional content of television food advertisements seen by children and adolescents in the United States. Pediatrics. 2007 Sep;120(3):576-83. Food for Thought: Television Food Advertising to Children in the United States. Kaiser Family Foundation. 2007 March. Brown and Ogden. Children’s eating attitudes and behaviour: a study of the modelling and control theories of parental influence. Health Educ Res. 2004 Jun;19(3):261-71.